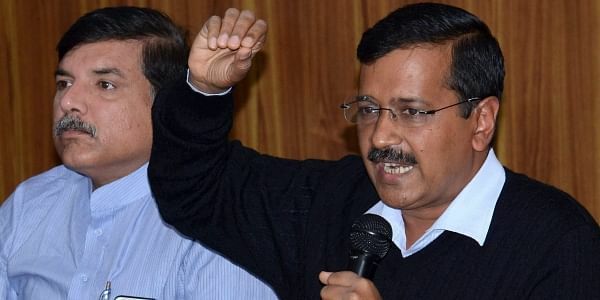 Delhi Chief Minister Arvind Kejriwal and his deputy Manish Sisodia, who came back from the Andamans today after a short break, are likely to meet party MLAs before the PAC meeting. NEW DELHI: A day before the Aam Aadmi Party announces its three Rajya Sabha nominees, Sanjay Singh has emerged as the sole consensus candidate while a number of prominent names within the party are vying for the other two slots. A senior party functionary confirmed city-based chartered accountant N D Gupta and businessman Sushil Gupta's names are in the reckoning as well while emphasising that a final call will be taken by the party's Political Affairs Committee (PAC) tomorrow. "There are capable leaders like Ashutosh, Atishi (Marlena), Pankaj Gupta, Meera Sanyal, Ashish Khetan even Raghav Chadha in the party. It is but natural that there will be some heartburn if one name is picked over the others. So nothing can be said for sure even at this point," the AAP functionary said, on condition of anonymity. Singh, Marlena, Ashutosh are full-time members of the PAC while Gupta and Chadha are its ex-officio members. Meanwhile, Gujarat Patidar agitation leader Hardik Patel gave a curious twist to the issue by publicly batting for disgruntled AAP founder Kumar Vishwas's candidature, saying he was best suited to take on "fake nationalists". "If there is someone who can silence the fake nationalists in the Parliament, then it is Kumar Vishwas but wonder who in the party is so insecure of his standing that he is hell bent on destroying the party," Patel tweeted. Reacting to Patel's tweet, suspended AAP MLA Kapil Mishra said, "In the entire AAP, only Kumar (Vishwas) can talk to Hardik. Last time, when Ashutosh went to meet Hardik, he had declined to meet him. So Kumar must have spoken to him." Vishwas, who is also a leader of the AAP's PAC, had openly expressed his desire for a nomination to the upper house of Parliament but subsequently had a bitter fall out with the party's top leadership. Earlier, the party had contacted around 18 eminent personalities from different walks of life including former RBI governor Raghuram Rajan, former union minister Arun Shourie, ex-Chief Justice of India T S Thakur and names from the world of cinema. "But they are hesitant due to the political atmosphere in the country. They fear vindictive action by the Centre upon associating with the AAP," another leader said. Elections to three Rajya Sabha seats from Delhi would be held on January 16. The AAP, which enjoys a brute majority in the 70-member Delhi Assembly, is set to win all the three seats. The last date to file nominations for the three Rajya Sabha seats is January 5.